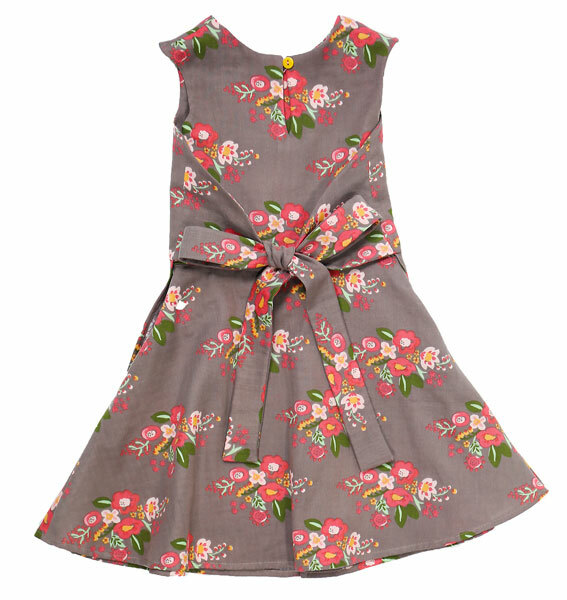 This girls' dress slips over the head and fastens both in front and in back for a fun twist on the wrap dress. The A-line skirt has lots of flare for spinning and includes an extra panel for full coverage. Details include built-in cap sleeves and a back keyhole opening with a simple button/loop closure. Choose to tie the dress in front (View A) or in back (View B). 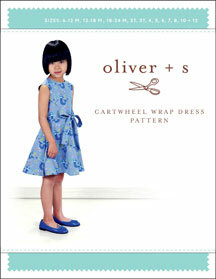 Share your photos on Instagram with the hashtags #cartwheelwrapdress and #oliverands. 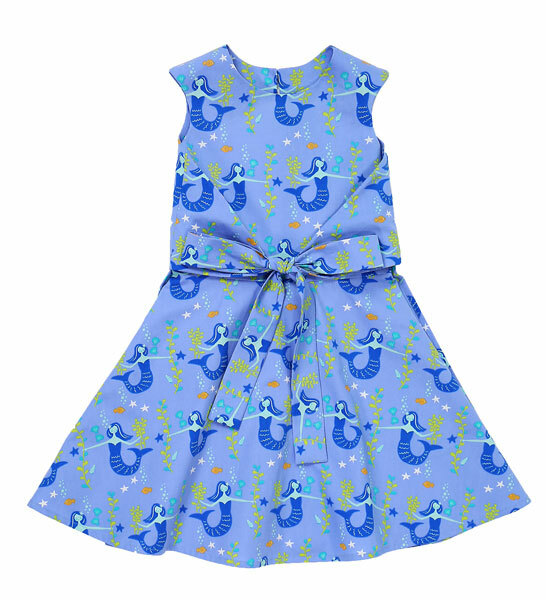 This girls' dress slips over the head and fastens both in front and in back for a fun twist on the wrap dress. The A-line skirt has lots of flare for spinning and includes an extra panel for full coverage. Details include built-in cap sleeves and a back keyhole opening with a simple button/loop closure. Choose to tie the dress in front (View A) or in back (View B). 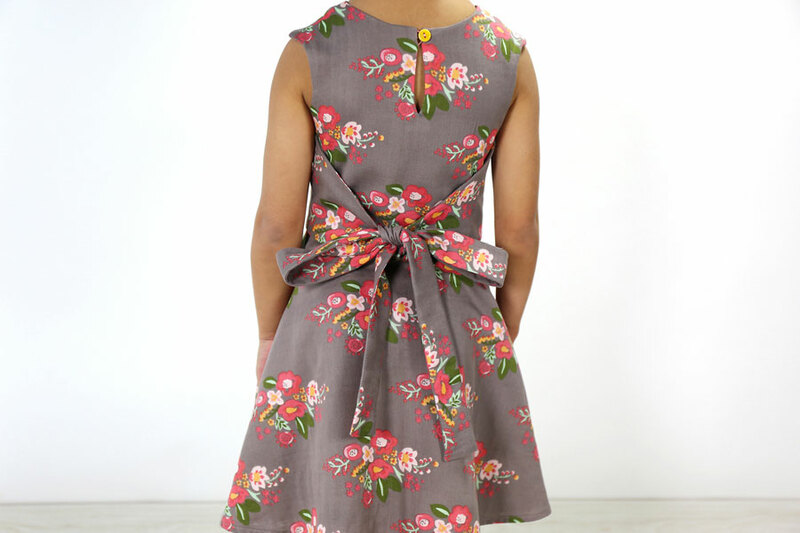 The dress is easy to sew because it doesn’t have buttonholes or zippers, and the construction method is unique and fun. 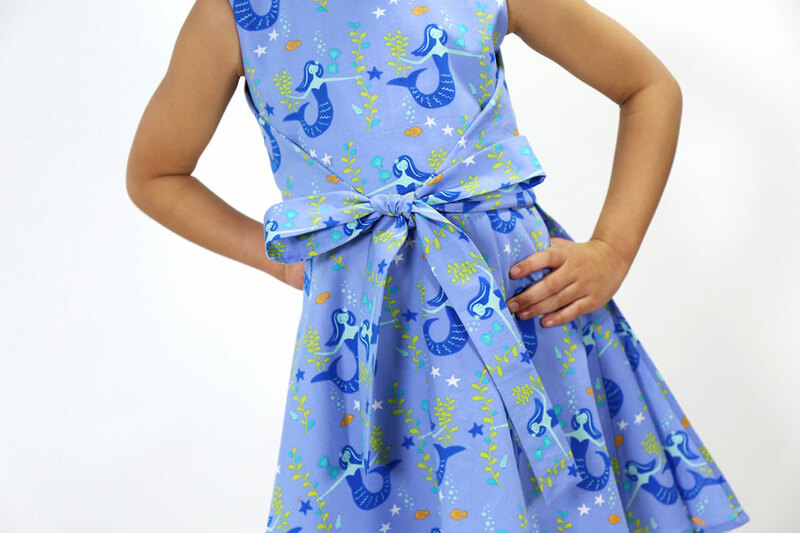 After successfully sewing this pattern, you will have developed the following skills: curved seams and linings. 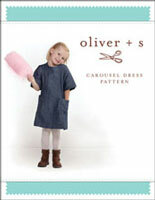 Coordinating thread, featherweight fusible interfacing, one 1/2" button, sew-in Velcro® or a snap. Chest * 19" 20" 21" 21 1//2" 22 1/2" 23 1/2"
Waist * 19 1/2" 20 1/2" 21" 22" 22 1/2" 23 1/2"
Length ** 16 1/2" 17 3/4" 19" 20 1/2" 21 1/4" 22 1/4"
Chest * 24 3/4" 25 3/4" 27 1/4" 28 1/2" 30" 31"
Waist * 24 1/2" 25 1/2" 27" 28 1/2" 29 1/2" 30 1/4"
Length ** 24" 25 1/2" 27 1/4" 28 3/4" 30 1/4" 32"
* Variable, due to wrap dress. My granddaughter does not like buttons or zips on her clothes and badly wanted some 'pretty dresses'. I had tried other dress styles in stretch fabrics with some success - at least one wear. 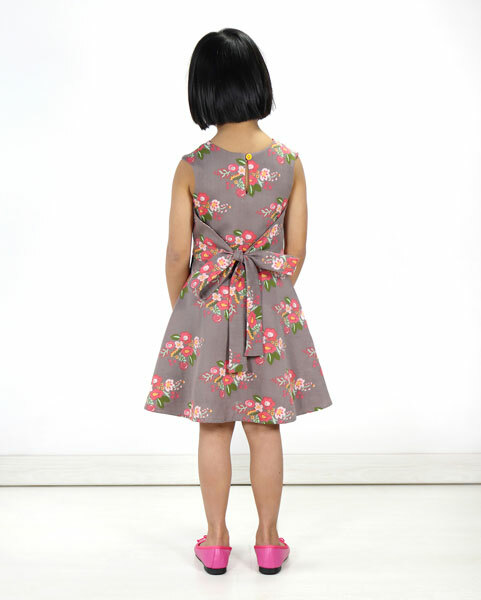 I made the first cartwheel dress in stretch fabric of her choice - it has been worn and washed constantly - a huge success!! I have almost completed a red Christmas one for her - we'll see how it goes in woven fabric. She has chosen fabric for at least 3 more. Thank you - my search for the 'pretty dress' pattern has a happy ending! So, I wanted contrasting ties. What did I learn? 1) if you are going to do contrasting ties, buy the full amount of suggested fabric for the dress and buy a 1/3 yard for the ties alone. 2) If you are going to do the wrap side pieces for contrast with the ties, buy a 1/2 yard of contrast and buy maybe a 1/2 less of your main fabric. Construction: As always, it is a bit ingenious. This is also a bit fiddly. It is not a hard dress but it takes a bit of time to do well. I suggest reading the directions in full first before you launch into it. The jelly roll is one of those things that is super hard to "get" from words and instructions, and super easy to do. Circle skirt hems can be challenging if you lack patience. I did a 1/4 guide stitch instead of a 5/8. I folded the 1/4 inch and pressed the heck out of it. I used a water spray bottle to soak it up nice. Once I did the 1/4 fold and pressed, I folded that and repeated spray, soak, press. Then I pinned. I did the small section and sewed that first. Then I did the large skirt, because I didn't want it to become unfolded as I sewed the other section. Lastly, my daughter NEEDS pockets. Now that I have made one, I will size up for a winter fabric so this can be a(n American) jumper. 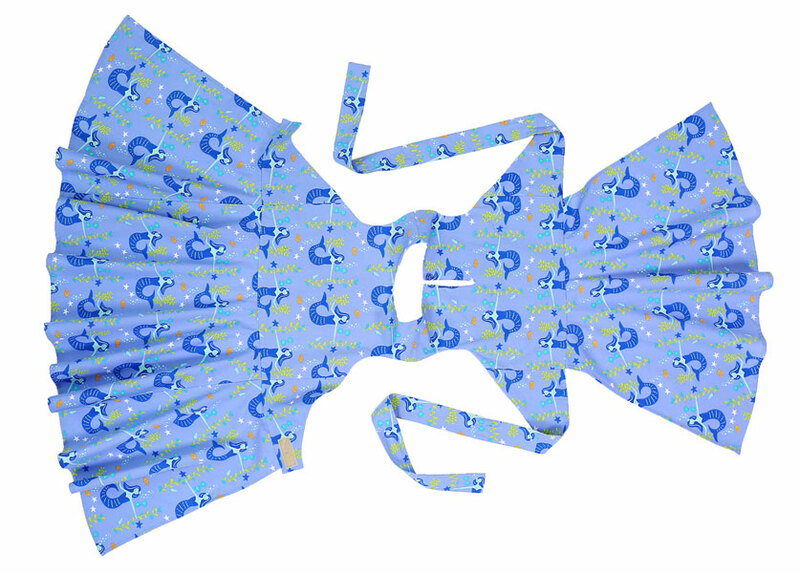 Then I will sew bag pockets in the side seams of the larger skirt part. They will be kind of hidden but she will think that is fun. I wanted to make this reversible for both of my granddaughters, one 6 year old and one 3 year old. Was a bit more complicated than I had made for quite awhile, but I took it slowly, following the instructions and the sew along and they turned out very well. I did add about 2 inches to each of the skirts so that they can hopefully wear then next year as well. I used some light weight cotton that was given to me. I made a size 4 for my 4-year-old granddaughter. Sizing was perfect. Instructions were crystal clear. I used 100% cotton Sevenberry quilting cotton. She loved her twirly dress. I made the version with the back tie because she’s just old enough to untie it, but not yet able to tie her own bows. I have a second one cut out ready to sew for another granddaughter. I intend to make this lovely dress for each of my girls. Incredibly cute, highly recommended. Loved the professional finished dress and great design. I did go to the great sew along photos to easily understand the jelly roll process. Pattern was brilliant Sewing was labour intensive but not hard I used a rose patterned 100% cotton from Ikea I thought it might be too heavy, but it draped well and will be sturdy for my very active granddaughter for whom the name "cartwheel" first caught my attention. Her comments once she figured out how to put it on, "It's beautiful. I don't ever want to take it off." I am a begginer at sewing and I am afraid not very good at it due to impatience, mostly. 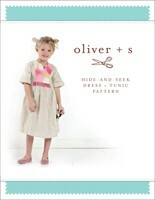 More than a year ago, I discovered Oliver + S patterns and its instructions which are just great for beginners. Being impatient, I made an effort and follow every single instruction and hints. The result has surprised me and most of all my family! My daughter just loves it! I would recommend this pattern to everybody able to follow sewing instructions in English. I used poplin fabric and the result, as I said, is really, really nice. I like the most the shape of the dress and the way it is assembled is just great. Made this for my granddaughter in a lovely zebra print material. Lovely pattern to make although you had to read it carefully for the turning through part. Looks absolutely lovely now its finished, can't wait to see her in it. I made this for my granddaughter out of denim and it turned out beautiful. I was a bit confused with the turning to right side out instructions but got there in the end,( unpicked 3 times.) Besides that the pattern is great. 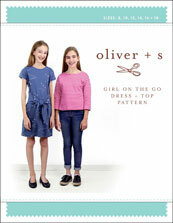 Discussion on the digital cartwheel wrap dress sewing pattern from the Oliver + S Discussion Forums. Find and share more photos on Instagram using the hashtags #cartwheelwrapdress and #oliverands.